… is, in my opinion, quite useful, especially for people who might tend to get deeper into kimono related things. When seeing a fully-sewn kimono you might misunderstand the construction of this traditional japanese garment. Lots of people have tried to sew a kimono by themselves without any deeper understanding of the kimono-parts‘ shape. When you ever have detached a kimono, you’ll know that it is made of nothing but rectangles. 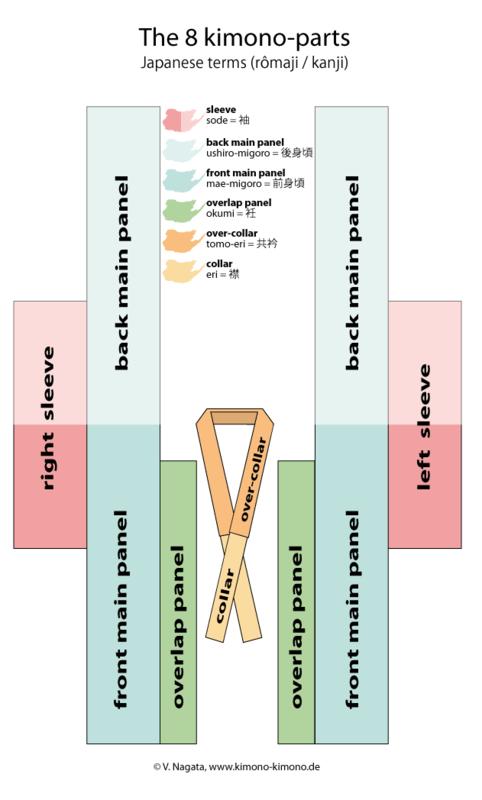 To sew 1 kimono, you’ll usually have to cut a bolt of japanese fabric into 8 parts: 2 sleeves, 2 main panels, 2 overlaps, 1 collar and 1 overcollar = 8 pieces, all of them rectangles. 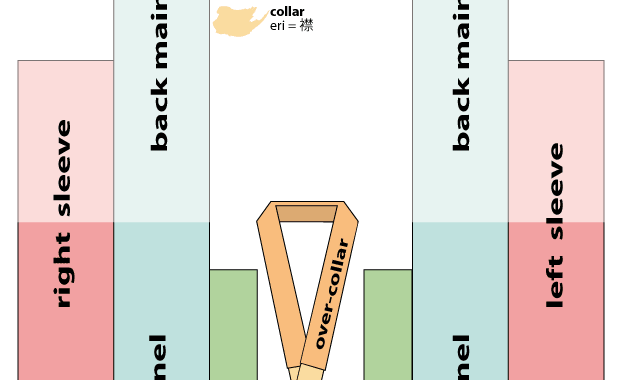 As you can see, the diagram is about the kimono-parts and their terms in English and Japanese. I already did a german version of this earlier. But as some of you kimono-fans will surely prefer english contents, I made a translated version of this diagram, hoping it could be of some use for you. I wrote the japanese terms in rômaji und kanji in order to offer the commonly used terms. Just for the case you want to do a google search for deeper knowledge about the kimono-parts. A click on the image will open a new window with the full-size image. The colour scheme will lead you from the kimono-parts to their terminology in English and Japanese, while the japanese terms are provided in rômaji and kanji. If you are a kimono-researcher or just want to learn more about those mysterious rectangles,which a kimono is constructed of, you’ll need the japanese writings as plain text. If you do have any questions on the kimono-parts or other kimono-related topics, don’t hesitate to leave a comment. 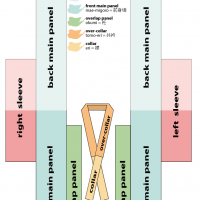 Posted in Kimono-Teile and tagged diagram, diagramm, japan, kimono, kimono-parts, kimono-teile, schaubild.